Windows Live SkyDrive is an online service that is offering free storage space for Windows Live users. Every Windows Live user gets currently 25 Gigabytes of storage space in the cloud which can be filled with photos, videos, documents and other files. The only restriction in place is a file size limit of 50 Megabytes per file. Files can be shared publicly which makes them accessible for users without a Windows Live ID. The free software program SkyDrive Explorer integrates the Windows Live SkyDrive storage space in Windows Explorer. It will display a new SkyDrive Explorer icon in the My Computer menu after installation. A login to Windows Live is required to access the data that is stored in Windows Live SkyDrive. The program will automatically display the login window with options to store the login data for easier usage. View the structure and contents of folders in SkyDrive. View files information (type, size, creation date in GMT format). Create new root folders and subfolders. Copy files into the storage. Copy files from the storage to the computer. Copy folders and subfolders from the storage to the computer keeping their structure. Use Drag & Drop for files operations. Create links to SkyDrive folders on your computer. 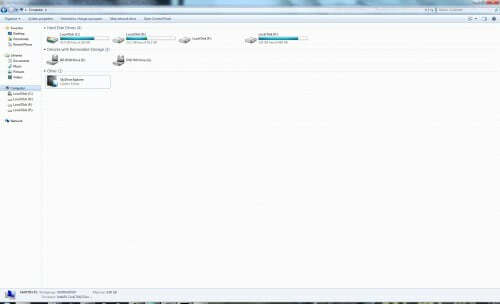 SkyDrive Explorer makes it easier to work with files that are hosted at the Windows Live SkyDrive service. It provides access to some features that are not offered by the web service itself including multi-file-operations like renaming, deleting or copying multiple files or folders. The standard Microsoft library for Windows Live ID services is used which means that the personal information are not passed to the SkyDrive Explorer engine. The traffic between the local computer system and the online storage uses the https protcol to protect against network snooping. Windows Live SkyDrive Explorer is available for 32-bit and 64-bit editions of Windows XP, Windows Vista and Windows 7. The program executables can be downloaded from the developer's website. Big thanks for this tip, man have I been waiting for something like this, Gladinet just doesn’t cut it for me. CGA, why don’t you like Gladinet? I’m using it for Windows Live SkyDrive and Google, and I’m curious to know why it doesn’t cut it for you. I’m using Gladinet now. The only problem is I can’t using F5 (Copy) hotkey to move multiple files in FreeCommander or TotalCommander. Otherwise, Gladinet is ideal for SkyDrive, Picasa web, Google Docs……. I’d like to use Skydrive but with a Sync tool. With Gladinet, dates are messed up so it doesnt work. Is it better with Skydrive explorer? Gladinet, at least for me, was slow as molasses and created a crapload of cache files which it didn’t clean up after itself. SkyDrive Explorer 1.0 Beta did not manage its way on my system at this time. Does anyone have a successful experience? I like the idea, and SkyDrive with its 25Gigs is interesting. I’d like to get this software to work, will be following its development. Great stuff. Gladinet has never worked for me due to restrictions at university in terms of the proxy and firewall. This works great. Is there any way to assign the explorer folder a drive letter or map it as a network drive so that I can use backup tools on it? The latest Gladinet version has proxy support. It still does not work unfortunately – gladinet developers are unable to diagnose my issues and hence I am unable to use it. Having now had a better play with this, I seem to having difficulties with this also. Folders don’t show up and I am unable to copy anything. I will have to stick with the multiple hard drive backups for now. has been released. Accidental Win 7 Explorer crash was fixed. Looks very tempting, gotta give it a shot. Thank you for sharing. It?s actually a nice and useful piece of info. I am happy that you just shared this helpful information with us. Please keep us up to date like this. Thanks for sharing. I Need Windows Microsoft Skydrive Software Install In My Computer .